The original Tibetan Wave Whips! 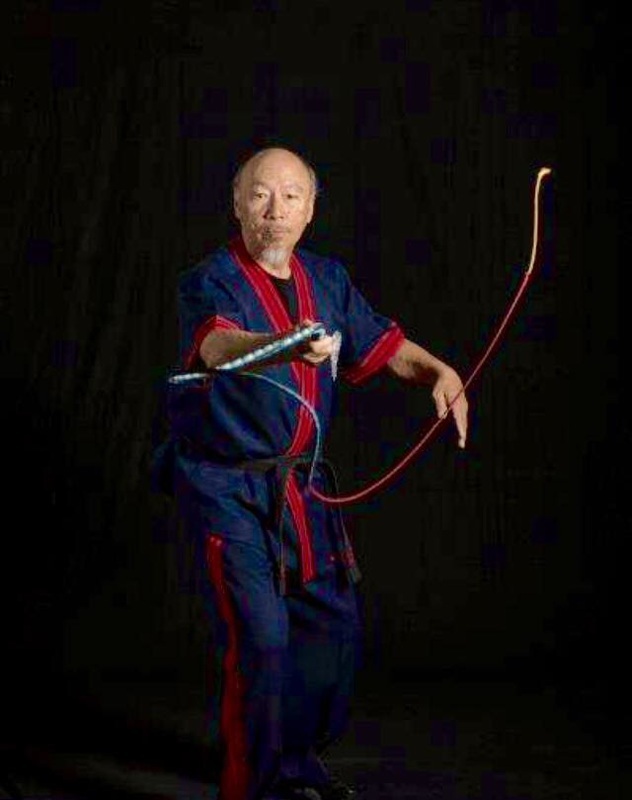 The Tibetan Wave whips are made specially for Tibetan Wave martial arts as taught by Grand Master Ron Lew. They are fast and heavy hitting. They feature the handle on a handle design (patent pending) that provides more control while using the upper knob. The standard length is 58 inches from the heel knot to the fall hitch with a 24 inch fall. Tibetan Waves come with 2 braided bellies, a medium shot load and 12 plait overlay. All come with Ron's signature double diamond pattern on the transition. Several years ago I took a fun class, taught by Ron, here in Moab. What a pleasure it has been to get to know him better and to build a friendship. It has been a grand adventure making prototypes of this whip and tweaking them till we got it just right. I'm grateful for the experience and all the encouragement. 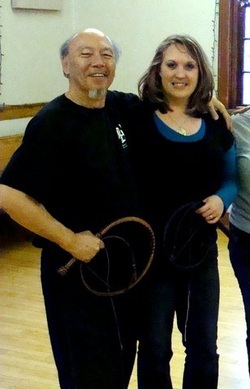 Ron travels the world teaching seminars on his Tibetan Wave whip system, Escrima and Tai Chi. He is such a fun and energetic teacher who really cares about every single student coming away a success. I have loved every class that I have taken from him. For more information on Ron and what he is up to, please click the button at the bottom of the page. 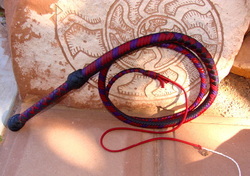 Tibetan Wave™ - $185 This is the original whip approved by Whip Maestro Ron Lew in all its glory. It is built to his exact specifications including the red, purple and black color pattern representing the power of sacred connection. Its important to Ron that everyone be able to afford a quality whip so we came up with three other options. They have the same inner workings as the Tibetan Wave and so are just as responsive. They have a simpler overlay design so the cost can be lowered. Phoenix Flame™ - $170 The newest incarnation of the Phoenix was designed by Bobbi HolyOak. It comes in an electric blue and acid purple serpent design that represents divine wisdom and vision. Phoenix Rising ™ - $170 This is the replacement for the Dragon's Tail whip. The Phoenix Rising comes in imperial red and slate grey. It represents releasing that which no longer serves us and embracing new changes that facilitate healing and growth. Sacred Flight™ - $170 The newest in the Tibetan Wave Series. 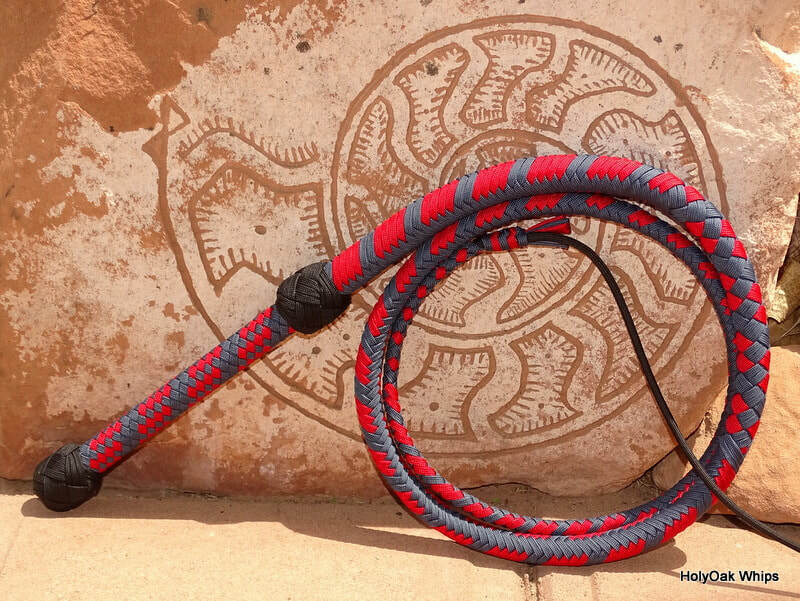 This whip comes in a tan and black serpent design that represents grounding and commitment. *The Dragon's tail and the Phoenix tongue have been discontinued. Yes, you have seen some pictures of slight variation in design but those are either the early ones before the design was decided upon or whips that were ordered by Ron for himself or as gifts. If you have your heart set on something different, please check out my Sonic Alignment whips and email me with your needs. This is a clip of GM Ron Lew, at CombatCon 2016, talking about the Tibetan Wave system and some of the things that make it unique. If you are looking for something that will work for the Tibetan Wave system as well as the Latigo Y Daga system and can also be fully customized, the Combat Bull is going to be the right choice. Combat Bulls are 5 foot long, 14 or 16 plait with a heavier shot load. They are heavier and slightly longer than the Tibetan Wave whips. They have a more ridged binding as well. You can customize the color and weight to fit your needs. "I have been Tom Meadows' training partner for over twenty years of whip exploration and we have long been searching for the "Holy Grail" of the whip world, a whip which would allow us to let go and let the whip itself be creative. I have purchased many whips, both kangaroo and nylon. I particularly love my kangaroo whips that were made by Peter Jack to Tom’s Filipino Fighting Whip specification. When Bobbi HolyOak approached me regarding making a nylon whip as good as our traditional kangaroo whips, I thought that would be an interesting challenge. I have never found a nylon whip that would even come close to the feel and movement of my kangaroo whips. Bobbi is a gifted whip designer, and after several trials and modifications to five distinctly different nylon whip designs, she quite thoroughly met both Tom’s and my own expectations. Bobbi HolyOak’s Tibetan Wave whip design is incredibly reactive and sensitive to any of my movements or gestures. It is as if the whip picks up my intentions and then finishes the movements – finishing my sentence before I speak. The Tibetan Wave whip design will allow you to explore and feel the connected fluidness. 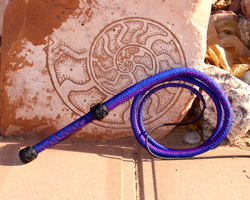 The Tibetan Wave whip provides the sensation: “Do less More, Do more Less”. You are really in the NOW. There is a sensation that the whip is alive and more important – it will let your inner child come out and play©." human body, and the movements of the free hand. and deceleration are the apex of being in the “Now”. move it. Be in the moment of gentleness, grace, flow and peace of mind". Have you ever wished that you could take a class with Ron Lew? Below is raw video of his 2017 CombarCon class. Please enjoy and come join us next year in Vegas!